"The Royal Wedding at Berlin"
The wedding of Prince Henry of Prussia , the younger son of the German Emperor  and Empress , with Princess Irene of Hesse , the third daughter of the Grand Duke of Hesse  and the late Princess Alice , was celebrated last week in the chapel of the Charlottenburg Palace . The ceremony was comparatively private, owing to the Emperor's health, but was nevertheless attended with all due Royal pomp, while a number of princely guests were present, including the Prince of Wales  and the Crown Prince of Greece . The chapel in which the service was celebrated, however, was too small to accommodate many guests, being intended to hold only forty persons, though, by removing the seats, room was made for a larger number. The interior of the chapel, which dates to 1708, is ornamented in rococo style, and for the occasion the walls were beautifully decorated with roses. As soon as the guests had assembled in the Palace, the Empress placed a crown, the emblem of royalty, on the bride's head , and the civil marriage was performed in the Blue Saloon by the Lord Chief Chamberlain. The Royal party then proceeded in procession to the chapel, where they were received and conducted to the altar by the Court Chaplain, Dr. Kögel, and his assistant clergy. The Royal Party formed a semicircle before the altar, the Dowager Empress  being present in her chair, while the minor personages were accommodated in rooms leading out of the chapel. 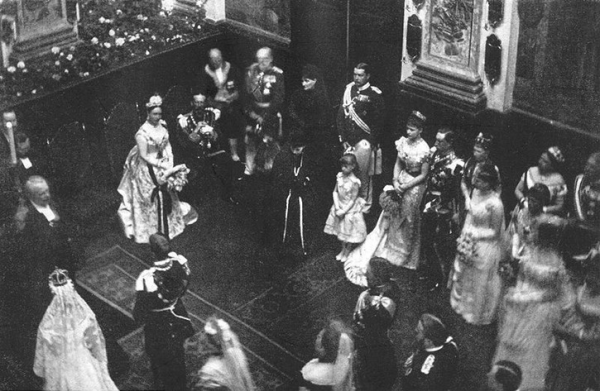 Almost as soon as the service had begun the Emperor entered, walking into the chapel with a firm tread, and took up his place at the right of the bridal couple, the Grand Duke Louis of Hesse, the father of the bride, standing on the left. Dr. Kögel then preached a sermon, the text being the twenty-seventh verse of the fourteenth chapter of St. John's Gospel, "Peace I leave with you, My peace I give unto you," in which he alluded to the fact that the betrothal took place on the late Emperor's ninetieth birthday, and the wedding on the birthday of Queen Victoria . A chorale of Sir Arthur Sullivan's was then sung , and the rings were exchanged -- this portion of the ceremony being signified to the outside world by three successive volleys of twelve cannon. The bridal couple next knelt to receive the blessing, and the service concluded with a hymn. The chaplain shook hands with Prince Henry and his bride, who then went up to the Empress Augusta, whom they kissed affectionately. The Empress Victoria, who was visibly affected, warmly embraced the Princess, as also did the Emperor. When, however, Prince Henry came up to the Emperor, the latter placed both arms round him, kissed him on both cheeks and on his forehead, and then held his hand on his head, retaining him long in a close embrace. The Prince of Wales also kissed his niece and shook hands with Prince Henry. The congratulations over, the Emperor bowed to the guests, and with the Empress Augusta and the Prince and Princess Henry withdrew, the choir singing the Hallelujah Chorus . The Emperor seemed very well throughout the ceremony, and did not cough once . He wore a general's uniform with the insignia of the Hessian Ludwig Order and Collar of the Garter, and the chains of the Black Eagle and Hohenzollern Orders. At the wedding breakfast the Crown Prince , acting for the Emperor, who was not present, proposed the health of the newly-wedded couple. By two o'clock the meal was over, and the bridal garter having been cut up and distributed according to custom, Prince and Princess Henry left an hour later for Schloss Erdmannsdorf in Silesia, where they have been spending their honeymoon. Prince Henry of Prussia was born on August 14th, 1862, and is the "Sailor Prince" of Germany, having been trained in the navy, and having seen a good deal of foreign service. In his honour the Crown Prince wore a naval uniform at the wedding. Princess Irene was born on July 11th, 1866, at Darmstadt. 1. Prince Heinrich of Prussia (1862-1929), the groom at this wedding, was the third child of Emperor Friedrich III of Germany and Princess Victoria of the United Kingdom. He was 25 years old when he married his first cousin, Princess Irene of Hesse and by Rhine. Most of his life was dedicated to the German imperial navy; he entered the naval service at the age of 15 and eventually became Commander-in-Chief of the Baltic Fleet. He resigned his commission at the end of World War I, when the monarchy was abolished. He lived the rest of his life with his family in Schleswig-Holstein. 2. Emperor Friedrich III of Germany (1831-1888), the 56-year-old father of the groom at this wedding, was only weeks into his 99-day reign as emperor when this wedding took place. The wedding was one of only a handful of major events that took place while he was on the throne. He was already terminally ill when he inherited the throne in March 1888, and he died in Potsdam on June 15, 1888, about three weeks after the wedding took place. 3. Empress Victoria of Germany (1840-1901), born Princess Victoria of the United Kingdom, was the 47-year-old mother of the groom at this wedding. The eldest child of Queen Victoria and Prince Albert, she married the future Emperor Friedrich III of Germany in 1858. They had celebrated their 30th wedding anniversary a few months before this wedding. But time was running out for them. 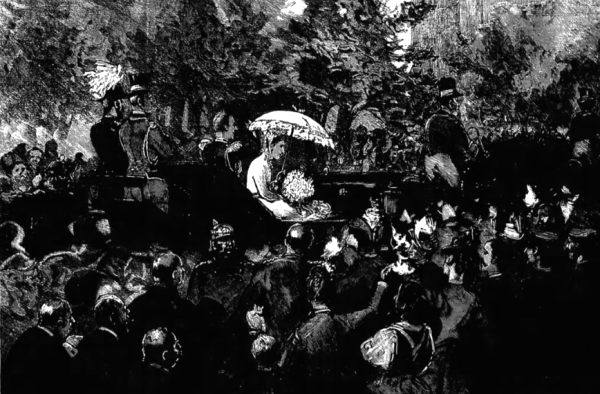 For the past year or so, Vicky had been engaged in a series of actions to try to prevent the destruction of her husband's legacy after his death. When she traveled to Britain to mark her mother's Golden Jubilee in 1887, Vicky smuggled boxes of important documents with her to Windsor Castle, so that they couldn't be intercepted by their enemies (including their heir, Wilhelm, who had a deeply complicated relationship with his mother). By May 1888, though, Vicky understood that she and Friedrich were simply "shadows ready to be replaced" when he died and was succeeded by their eldest son, Crown Prince Wilhelm. After Friedrich's death in June 1888, Vicky became known as "Empress Frederick," settling in her widowhood at Friedrichshof, a castle she built in her husband's memory. 4. Princess Irene of Hesse and by Rhine (1866-1953), the bride at this wedding, was 21 years old when she married her first cousin, Prince Heinrich of Prussia. She was the third child of Grand Duke Ludwig IV of Hesse and by Rhine and the late Princess Alice of the United Kingdom, a younger sister of Empress Victoria. Irene and Heinrich had a happy marriage, but their lives were full of familial tragedy. Irene was a carrier of hemophilia, the disease that caused so much strife among Queen Victoria's descendants. Two of Heinrich and Irene's three sons suffered from hemophilia, and one died after a fall at the age of four. Heinrich's brother was Kaiser Wilhelm II -- and we all know how that went. And Irene's siblings included both Empress Alexandra Feodorovna of Russia and Grand Duchess Elizaveta Feodorovna of Russia -- so no good news at all on either front there, either. 5. Grand Duke Ludwig IV of Hesse and by Rhine (1837-1892) was the 50-year-old father of the bride at this wedding. He had been a widower for a decade; his wife, Princess Alice of the United Kingdom, had died of diphtheria in 1878, along with one of their daughters, Marie. Four years before this wedding, Ludwig had attempted to marry again. He married Countess Alexandrina Hutten-Czapska morganatically in Darmstadt in 1884, but the union so horrified his children and the British royals (his late wife's relatives) that it was annulled shortly afterward. He remained single for the rest of his life, dying of a heart attack about four years after Irene's wedding. 6. Grand Duchess Alice of Hesse and by Rhine (1843-1878), born Princess Alice of the United Kingdom, was Princess Irene's mother. The third child of Queen Victoria and Prince Albert, she died in 1878, when Irene was only twelve. Alice's death, which occurred on the 17th anniversary of her father's death, was incredibly distressing for Queen Victoria. She was also deeply mourned by her sister, Victoria (Prince Heinrich's mother). 7. Schloss Charlottenburg, located in Berlin, was a residence of the Prussian royal family for more than two centuries. In May 1888, it was the home of the reigning imperial couple, Friedrich and Victoria. The palace was severely damaged during World War II, but it was later restored and is now a major tourist attraction. 8. King Edward VII of the United Kingdom (1841-1910), then Prince of Wales, was an uncle of both the bride and the groom at this wedding. Forty-six-year-old Bertie and his wife, Alexandra, had recently celebrated their own silver wedding anniversary. While in Germany for this wedding, Bertie also made a visit to Pomerania (a region of the shores of the Baltic Sea), where he reviewed troops of the Blücher Hussar Regiment, of which he served as Colonel-in-Chief. A grand farewell dinner was given in his honor at the British Embassy before he returned to England. But he was back in Germany only a few weeks later, with Alexandra and their eldest son, Albert Victor, to attend his brother-in-law's funeral. 9. King Constantine I of the Hellenes (1868-1923), then Crown Prince Constantine, was only 19 when he attended this royal wedding. Constantine spent much of his youth in Germany, where he served in the German Imperial Guard. He had visited the imperial court again in March 1888 after the death of Emperor Wilhelm I; on that occasion, he caught the eye of one Emperor Friedrich III's daughters, Princess Sophie of Prussia. The two fell in love, and by September 1888, they were engaged -- though the match initially faced resistance from both families, especially Sophie's eldest brother, Emperor Wilhelm II. 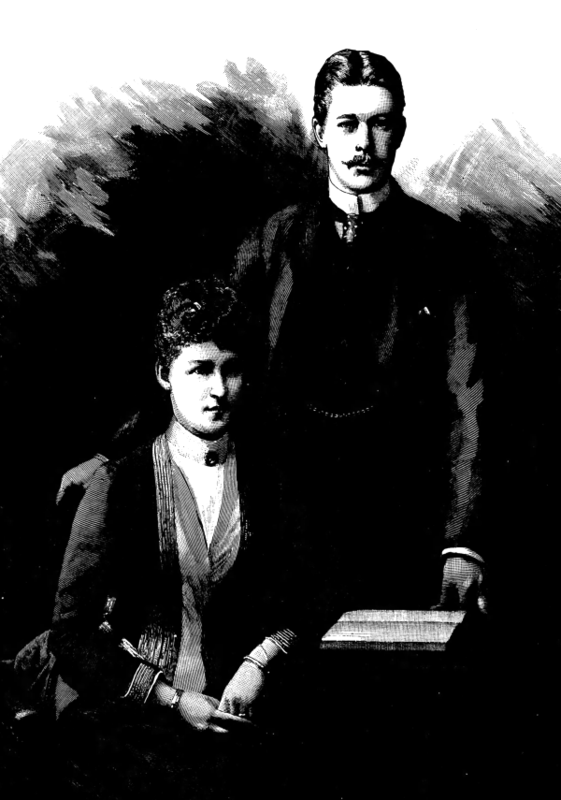 Constantine and Sophie married in Athens in October 1889. Prince Heinrich, Sophie's brother (and the groom at this royal wedding), served as one of the witnesses at her wedding. 10. 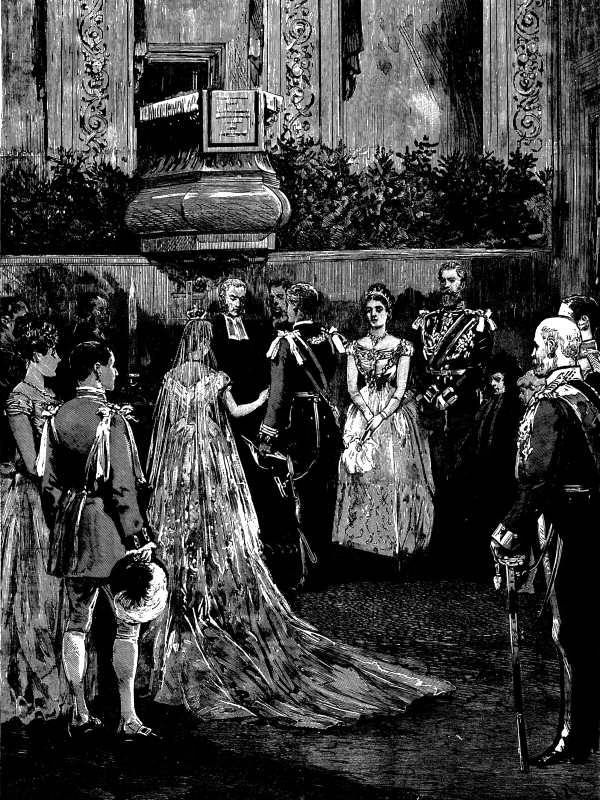 From the May 26, 1888 issue of The Graphic: "The bride was to wear numerous Crown jewels, and a special brilliant diadem made for the occasion, which the Empress will herself place on the head of her new daughter-in-law." The diadem in question appears to be the nuptial crown visible on Irene's head in photographs from the wedding. 11. Empress Augusta of Germany (1811-1890), born Princess Augusta of Saxe-Weimar-Eisenach, was the paternal grandmother of the groom at this wedding. Augusta, who was 76 years old in May of 1888, had recently been widowed; her husband, Emperor Wilhelm I of Germany, had died on March 9, 1888, after a short illness. The couple had renewed their wedding vows a year earlier, on March 22, 1887 -- Wilhelm's 90th birthday -- the same day that Heinrich and Irene's betrothal was officially announced. At this wedding, Augusta was a frail figure, wearing black, seated in a corner of the chapel. She died in January 1890. 12. Heinrich and Irene's betrothal was officially announced to the public on March 22, 1887, the 90th birthday of his grandfather, Emperor Wilhelm I of Germany. (Emperor Wilhelm and Empress Augusta renewed their vows on that date as well.) 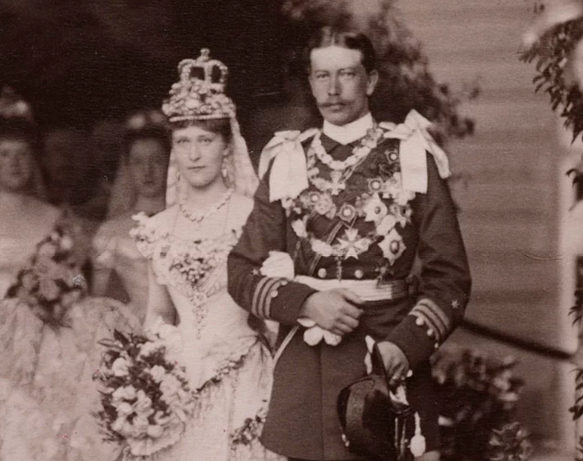 Their wedding took place on March 24, 1888, the 69th birthday of their shared maternal grandmother, Queen Victoria. She was initially not thrilled about the match between her grandchildren -- mostly because she wasn't involved in its engineering. 13. Sir Arthur Sullivan (1842-1900) was a famous British composer, best known for his collaborations with W.S. Gilbert. This was not Sullivan's first association with a royal wedding; he composed several pieces in 1863 for the wedding of the couple's shared maternal uncle, the Prince of Wales. He was knighted by their maternal grandmother, Queen Victoria, in 1883. 14. The Hallelujah Chorus is part of the Messiah, an oratorio composed in 1741 by Georg Friedrich Handel. Born in Germany, the composer later became a British subject and composed several works associated with the royal family, including the coronation anthem "Zadok the Priest." 15. Friedrich was suffering from terminal laryngeal cancer. He managed to walk and stand during the wedding, but he was otherwise mainly confined to his bed. He had only weeks to live. Like his father, Prince Heinrich also eventually died of throat cancer. 16. Emperor Wilhelm II of Germany (1859-1941), then Crown Prince Wilhelm, was the 29-year-old brother of the groom at this wedding; he was also essentially the emperor-in-waiting. His father was gravely ill, and Wilhelm succeeded him only a few weeks after this wedding. He would be the last German emperor.